With our 12 hectares of vineyards surrounding the hotel itself as a divine protection, three hectares that the most courageous can discover on foot in the mountains overlooking Gigondas, we produce 8 cuvées that cover the appellations Gigondas and AOC Côtes du Rhône Villages Sablet and Séguret. It is a pleasure for us to make them discover during tasting at the cellar of the domain! Located at the foot of the Dentelles de Montmirail, the vines benefit from an exceptional terroir. Soils derived from calcareous rocks decomposed with varying proportions of pebbles giving the grapevine only what it needs for a moderate and qualitative production. The exposure of the slopes gives an optimal sunshine, the vine gives us then grapes bursting with sun and flavors. The fine and fresh aromas of this wine remind us of spring. 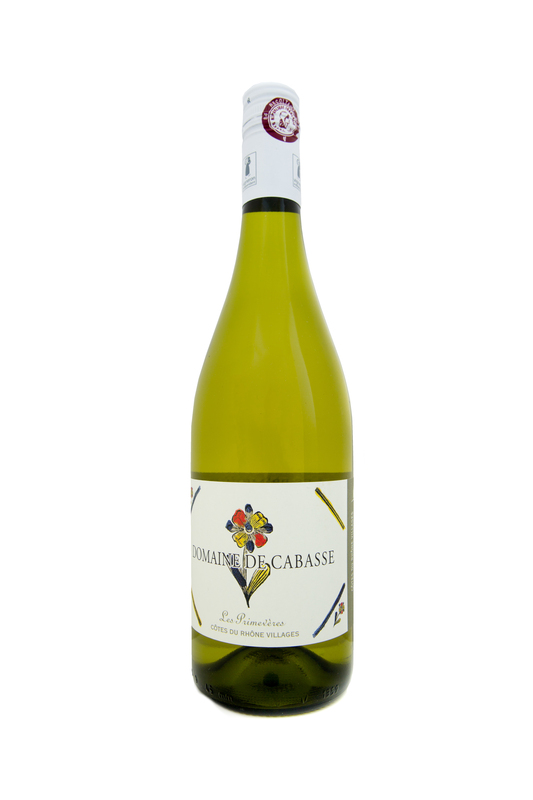 It is composed of Roussanne, White Grenache, Viognier and Clairette. Appellation : Appellation Côtes du Rhône Villages contrôlée. Vinification : Directly pressed. Low temperature fermentation. Bottled : during the spring following harvest. Description : white flowers, lime, citrus, apricot and honey on the nose. Well-balanced and pleasant freshness. Wine and food : as an “aperitif” with grilled fish or white meat. A beautiful complexity for this rosé which deserves to be associated to our summer cooking. Appellation : Séguret Appellation Côtes du Rhône Villages contrôlée. Description : Translucent rose petal colored. Fruit aromas and floral touches. Its balance and roundness make it the ideal friend for your summer evenings. Wine and food : “Aperitif” and Tapas, paella, white fish and meat, Asiatic food. Assemblage : 100% grenache noir, issu de nos plus jeunes plantiers. Cette vigne est tout à fait prometteuse. Robe : D’un rouge sang intense, la couleur est gourmande. Arômes : Nez très fruité, aérien avec des notes discrètes de fruits rouges bien mûrs. Bouche : Très facile d’accès, les arômes de fruits rouges se prolongent agréablement sur le palais et tapissent les joues comme une friandise. Ce vin est l’expression parfaite des jeunes vignes dont il est issu. A table : C’est le vin idéal pour accompagner en toute simplicité les repas d’été à base de viandes grillées. Convivial et chaleureux il sait resté simple. Garde : Le conserver quelques années parait possible, mais c’est bien sur l’énergie de son jeune âge qu’il sera le plus apprécié. Expressive fruit, a pinch of spices and roundness together with supple tannins. A wine of pleasures for any occasion. Vinification : stemmed grapes, 6 to 10 days maceration. Description : Garnet-color. Fine red fruit and spices aromas. Silky in mouth, laces of elegance at the end. Wine and food : “Aperitif”, cooked pork meats, pasta. This wine adapts itself to any event. Can be tried with a “rouget”fish. Structure and complexity of a traditional Séguret Côte du Rhône Villages. A beautiful expression of Grenache which marvelously matches the Provencal cooking. Vinification : stemmed grapes, 14 to 18 days maceration. Bottled : 18 to 20 months after harvest. Description : dark rich color. Spice and fruit aromas. Nicely structured, full-bodied and elegant at the end. Wine and food : Mainly Mediterranean and more precisely Provencal cooking. Lamb, “ratatouille” and fish can be also tried. Can also be married with a mixed cooking issued from both Mediterranean sides: Maghreb and Provence. A well-balanced marriage between Syrah and Grenache, nice complementarity which perfectly shows up when aged in barrels. Aged : in French oak barrels from Allier during 12 months. Description : Rich purple reflects. Red and black fruit, pepper and coffee aromas. This wine offers a lovely roundness in mouth. Elegant, long at the end. Can be married with black chocolate or even better: let’s discover this wine with a prune chocolate! A traditional approach and assemblage for this magnificent soil. Complex and structured, this Gigondas shows a wonderful balance, pure elegance. Appellation : Appellation Gigondas Contrôlée. Vinification : stemmed grapes, 15 to 20 days maceration. Aged : in traditional “foudres ” during 9 months. Description : Rich ruby color. Spice, white pepper and candied fruit aromas. Nice roundness in mouth. Mineral fragranced spices. Complex and structured wine. Wine and food : Provencal cooking, perfect on a leg of lamb. Can be tried with spiced chocolate. Ideal for our oldest Syrah; Syrah for the structure and the aromas, and just a touch of Grenache for the volume in mouth. A powerful and complex wine, at its best after several years in barrels. Vinification : stemmed grapes, 16 to 20 days maceration. Aged : in barrels from Allier during 18 months. Bottled : 28 to 30 months after harvest. Description : Ripe blackberries, spices, pear and vanilla on the nose. Rich fruit and oaky aromas in mouth. Very good structure of soft tannins. Rich and full. “Longue garde”. Wine and food : Red meat, cheese. This wine must be left to breathe before tasting. It’ll be worth waiting for! Your subscription to our newsletter has been successfully registered.